Growing up, many little girls imagine their wedding day will be the time when they at long last get treated like the princesses they pretend to be day in and day out. They'll have a glorious gown like Belle did in Beauty and the Beast, a handsome prince like Cinderella's, and a reception festooned with delicate decorations and packed with loved ones like Ariel's at the tail end of The Little Mermaid. It would be Disney princess perfect. 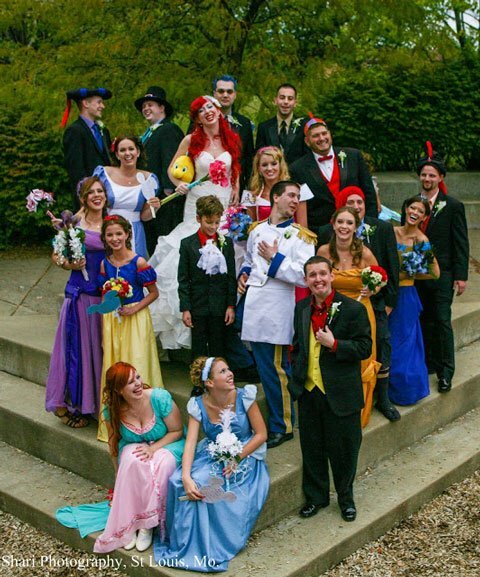 Plenty of little girls do grow up to make themselves self-proclaimed princesses on their wedding day, but no one has done so as impressively as the couple who took cosplay to a whole new level of awesome with a full-on Disney themed wedding. Checkout a few photos from their album below, thanks to a tip from io9. Or check out the full gallery at Shari Photography. 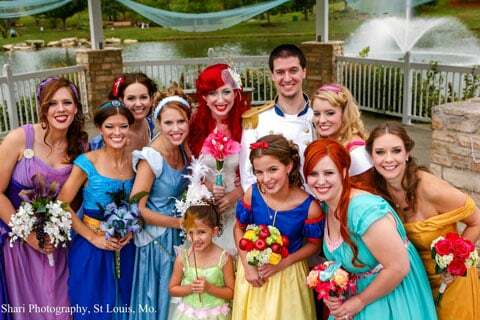 As you can see here, the bridesmaids each went as a different Disney princess, while the bride and groom dressed as Ariel and Prince Eric from The Little Mermaid. Left to right it appears we have Meg (Hercules), Jasmine (Aladdin), Alice (Alice in Wonderland), Cinderella, Ariel & Eric, Snow White, Giselle (Enchanted), Aurora (Sleeping Beauty), Belle (Beauty and the Beast), and up front a little Tinkerbell (Peter Pan). The Groomsmen got in the game too. But rather than appearing as a pack of interchangeable princes, they went as Disney villains. 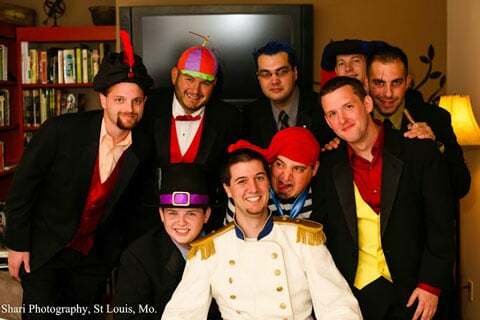 Left to right we have Jafar (Aladdin), Tweedle Dee or Tweedle Dum (Alice in Wonderland), Governor Radcliffe (Pocahontas), Prince Eric, Smee (Peter Pan), Hades (Hercules), Gaston (Beauty and the Beast), Frollo (The Hunchback of Notre Dame), and Scar (The Lion King). 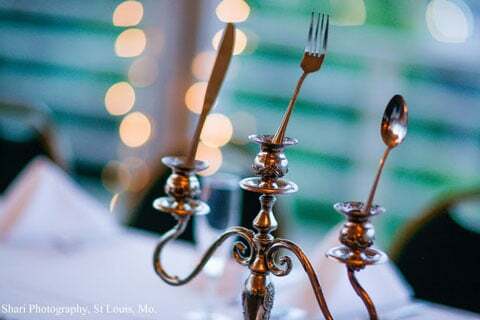 The wedding and reception had tons of darling Disney touches, from table décor themes based on Disney movies, to special bouquets catered to each princess, and the father of the bride donning a King Triton crown and carrying a trident down the aisle. But my favorite touch is this centerpiece that comes straight out of Ariel's secret hideaway of treasures. Truly, this bride is the girl who has everything. 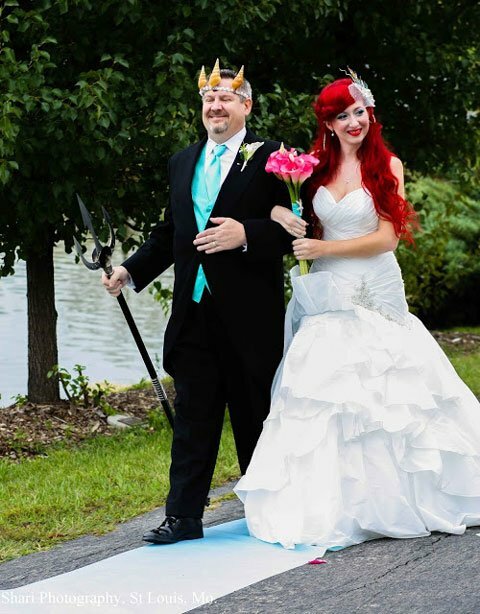 Congrats to the happy couple, and cheers to their friends who made this cosplay extravaganza possible.